There is a sense of shock both in Britain and across Europe in response to the Brexit vote. But it should not come as a shock. The polls had consistently suggested that this would be a very close race and many had put the Leave side ahead in the days and weeks leading up the vote. We also know that referendums are highly unpredictable, and that voters often vote against proposals put to them by the government and supported by mainstream political parties and experts. The Brexit vote also represents a victory for the populist forces that have gained ground in electoral contest across Europe and the United States in recent years, generally fuelled by worries about immigration, a lack of economic opportunities and anger with the political class. Why did British voters reject the EU? One reason why referendum outcomes are particularly unpredictable is that they present ordinary citizens with an opportunity to “stick it” to the political establishment. A division found in many referendums, including this one, is thus one between “the ordinary people” and “the elite”. This populist argument was successfully exploited by the Leave camp who portrayed the referendum as a chance for ordinary citizens to “take back control” from the elites in Brussels. This has strong appeal especially to voters, particularly those who feel disaffected with the political establishment and threatened by the forces of globalisation and European integration. A particular source of this disaffection was growing concerns about immigration, which have long been one of the most salient issue for British voters, but which the mainstream political parties have failed adequately to address. The Leave side presented the referendum as a unique opportunity to vote leave to regain control of British borders and restrict immigration. Survey evidence suggests that this was a core concern among Leave voters, and ultimately outweighed the fear of economic insecurity that the Remain camp had argued would follow from a Leave vote. Such fears of immigration are more pronounced among voters in a more vulnerable position in the labour market. The survey data shows that it was the so-called “losers” of globalisation, those with lower levels of education and working class occupation, who voted decisively for Leave, whereas the “winners” of globalisation – e.g. highly educated professionals – were overwhelmingly in favour of Remain. This is not a uniquely British phenomenon. We see the same divisions when we study Euroscepticism across Europe, and in many countries such concerns about the EU and immigration have been translated into a boost in the electoral support for rightwing populist parties, such as the Front National in France, Geert Wilders’ Freedom Party in the Netherlands and the Danish People’s Party in Denmark. Indeed, these are the very parties that are now calling for referendums on their countries’ membership of the EU after the Brexit vote. There was also a stark generational divide in the UK referendum. Polling evidence suggests that the over-45s voted to leave while the under-45s voted to stay in the EU. The results of this referendum portrays a deeply divided country, not only along class, education and generational lines, but also in terms of geography. While both England and Wales voted 53 per cent Leave, Northern Ireland and Scotland voted Remain (at 56 and 62 percent respectively). The only region within England to vote Remain was London, and it did so decisively with 60 per cent of the vote. 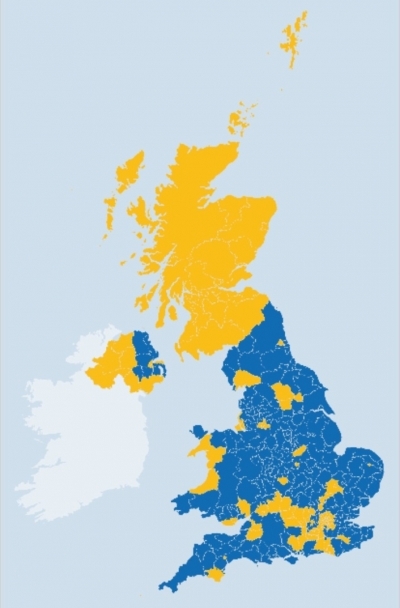 Note: Yellow indicates that Remain won in the area while blue indicates Leave won. Generally, the Remain side did better in the larger multicultural cities and where there were more graduates, whereas the Leave side was strongest in the English countryside and did better than expected in the post-industrial Northeastern towns with larger working class populations. Again, these divisions reflect wider inequalities and differences in British society that are likely to remain also in a Britain outside the European Union. Note: This article gives the views of the author, and not the position of EUROPP – European Politics and Policy, nor of the London School of Economics. Featured image: Thor / Wikimedia Commons. Sara Hobolt is Sutherland Chair in European Institutions at the European Institute. Her recent publications include Democratic Politics in a European Union under Stress (edited with Olaf Cramme) and Blaming Europe? Responsibility without Accountability in the European Union (with James Tilley). If Remain had stuck to an argument “on balance” it might have held on ….. I was very interested in Prof Hobolt’s ‘Why did voters choose Brexit?’. The piece indicates the main conditioning factors and forces which shaped the voting intentions of different demographics in the 4 main parts of the UK. At the same time, some of her findings were spot on regarding the two campaigns, citizen ‘push back’ and disaffection with government, though needing a bit more detail. For example, Prof Hobolt argues that the Brexit result did not come as a shock, rather the polling agencies had already signalled that the race was too close to call and ‘had put the Leave side ahead’. I’m not sure about this. Funnily enough, as someone who followed closely the progress of the campaign over the final 3 weeks, my own personal recollection of daily polling numbers via tv, radio and newspapers etc was the way that the media tended to suggest a growing lead for the Remain campaign, i.e. not for Leave. For example, ‘The Remain campaign continues to strengthen its position among voters with another week of effective campaigning while the Leave campaign dwindles, having failed to quell ongoing concerns about the financial and economic consequences of a Brexit,” Lynton Crosby, the political strategist who masterminded Prime Minister David Cameron’s 2015 general election victory, wrote in the paper.’ (see ttps://www.yahoo.com/news/polls-uk-remain-camp-boost-three-weeks-eu-062822698.html). So effective was the Remain message that the Leavers final, post-campaign farewell party of June 23 2016 was actually cancelled, since the campaign team were wholly convinced that they faced a narrow defeat. In other words, I suggest that the Brexit victory did emerge as something of a surprise at the last minute and caught the main Brexit leaders and debaters on the hop and poorly prepped to meet the media avalanche which ensued on 24 June. Briefly, as for citizen ‘push back’, I think it is vital to analyse the ways in which the Remain campaign hammered or ‘stuck it’ very aggresively to Brexit-inclined voters, via the ‘project fear’ rhetoric of economic doom and armageddon. This was seen in George Osborne’s quite ludicrous ‘punishment budget’ near the end of the campaign. Such doom mongering seemed only to embolden and capture more undecideds for the Leave side. I also believe that Cameron’s decision to suspend the whole referendum campaign for nearly 72 hours on account of the Jo Cox attack in Batley, without any explanation, led many citizens to regard the stoppage as a means of deraiilng the Brexit campaign. Many people saw this as unfair, and a deliberate manipulation. What also needs more explanation is why Britain’s ethnic minorities appeared not to understand or factor in the unfairness of EU immigration policy, which gave European nationals special ‘free movement’ entitlements and concessions over non-EU migrants in entering the UK, who experienced their own version of a points-based immigration test.